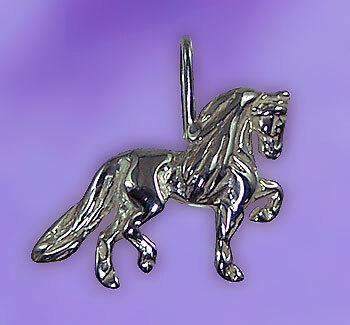 Here we have a beautiful Friesian sterling silver pendant. Offering fabulous detail and a two dimensional design. Give the gift that will keep giving to any Friesian horse admirer. Dimensions: 1/2 inch tall x 5/8 inches wide. Avaialable in 14kt yellow gold, 14kt white gold, or sterling silver.